DOVAH- is part of the collection "linea worm". 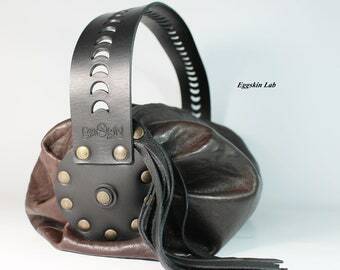 Dovah is a generous, roomy and soft leather bag. Its colour is black. 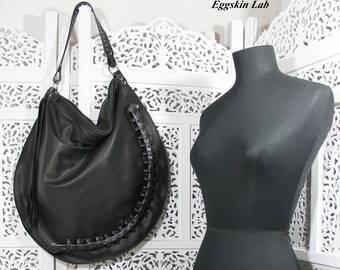 Roomy and soft leather bag, black italian leather bag, leather purse, collection purse, black leather purse, black purse, bag, purse. 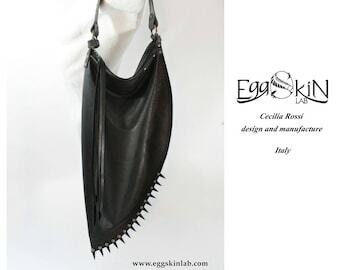 Ombra with spikes is an extravagant and bizarre design bag. Soft genuine leather, handmade in Italy. Rock, punk, rock chic, gothic, goth. 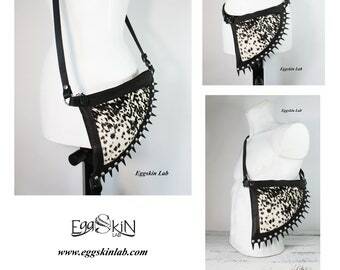 Unisex fanny pack, Makar with Spikes, mono-pouch pocket, little shoulder bag, genuine leather pouch, worn round the waist, goth, rock, punk. Get free shipping with 300€ (US$380 approx) minimum purchase! 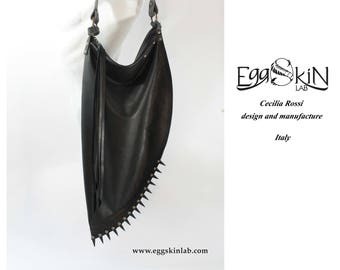 Here I present some of my work, mostly italian leather and fabric accessories of high quality. - The most of items are made to order and will be shipped within 3 - 8 business days. - Customized items usually takes about 5 - 10 days to make. - To Europe and U.K. basically it will take 5 business days for delivery with the express shipping, 15 days for delivery with standard shipping. - To U.S, Canada, Australia and rest of the world it will take 5 business days for delivery with the express shipping, 15 days for delivery with standard shipping. If you have any question please feel free to contact me, I'll be happy to answer you and help you. Unique, one piece only. 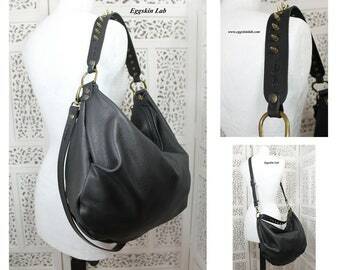 Brown and black leather bag, soft leather bag. The fixed handle is carved by hand. Brown purse, handbag, leather. Unique, one piece only. 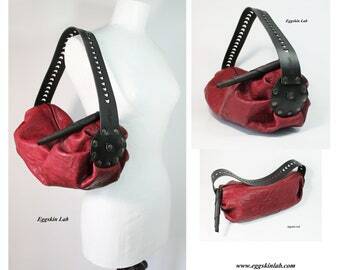 Red and black leather bag, soft leather bag. The fixed handle is carved by hand. Red purse, handbag, red leather. Limited edition, only two pieces. SILK & STUDS. Shoulder bag. Handbag. SILK purse. 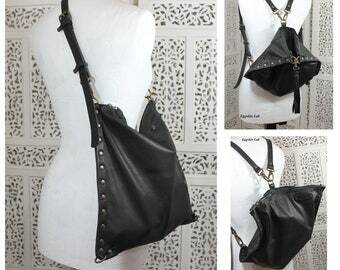 Cross body bag. Silk purse. 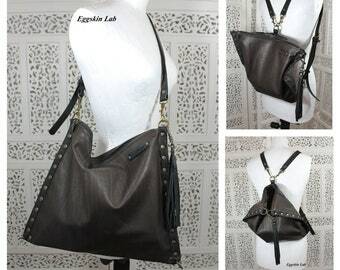 Silk and leather with studs. CARAXES Medium size is a soft purse. 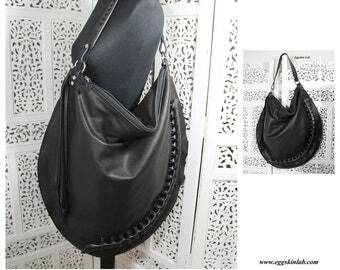 Black italian quality leather purse with studs. Handbag. Leather purse. 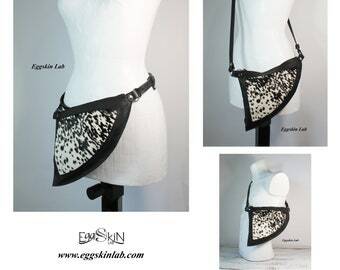 Crossbody bag. Shoulder bag. Convertible Bag, black leather bag and backpack, leather bag, brown leather backpack, convertible backpack bag, leather shoulder bag, bag. Convertible Bag, dark brown leather bag and backpack, leather bag, brown leather backpack, convertible bag, leather shoulder bag, bag. Convertible Backpack, black leather backpack, leather backpack, brown leather backpack, convertible backpack bag, leather shoulder bag, bag. 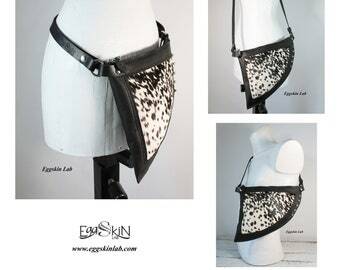 VILDE XXL SIZE is a soft leather bag, black leather purse, like an organic insect, giger inspired, H.R.Giger, shoulder bag, crossbody bag. 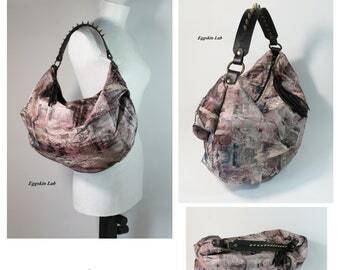 Talia Plain is a roomy and soft shoulder bag, leather purse, italian quality leather, mauve color, dark brown color, black color, soft bag. ETHEL, crocodile, roomy and soft leather bag, leather purse, italian leather purse, black purse, soft bag, soft leather purse, shoulder bag. 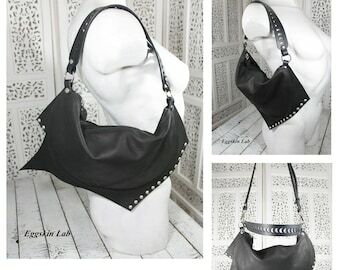 Soft shoulder bag, leather purse, italian leather bag, soft leather bag, soft purse, crossbody bag, black leather purse, bag with studs. 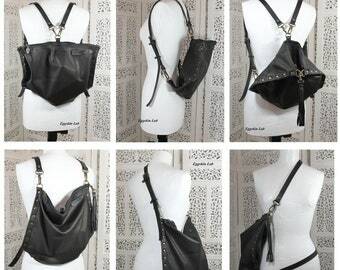 Mini black leather purse, italian soft quality leather, Mini bag, mini shoulder bag, cross body bag, cross body purse, rock/dark/goth purse. 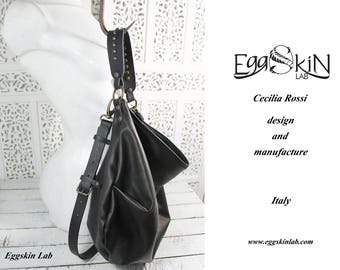 Etta-mini bag, limited time only, mini bag, mini purse, leather purse, vintage buckle, limited edition, few pieces, handmade in Italy. Earrings / earring, leather earrings, black earrings, pendant earrings, silver earrings, dark earrings, goth earrings, silver and leather. 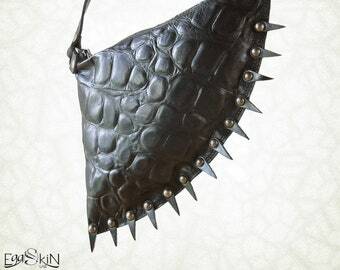 Makar with Spikes,mono-pouch pocket, little shoulder bag,genuine leather pouch,unisex fanny pack, worn round the waist, goth, rock, punk. Mini, black, leather purse, italian soft quality leather, mini purse, shoulder bag, cross body bag, italian leather purse, rock, dark, goth. Black italian leather backpack, soft leather with strong leather strap carved by hand, adjustable straps, handmade in Italy with love. The F. Bag is a soft, and voluminous bag. 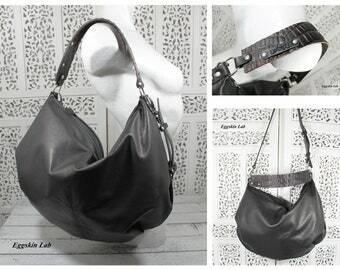 The Italian genuine leather used, is high quality and very soft. Centipede, bracelet with an unusual organic looking shape, this collection is inspired by H.R.Giger and his great artworks, unisex cuff. Centipede is a necklace with an unusual organic looking shape. 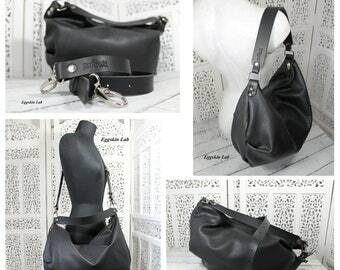 A jewel made in high quality italian leather. Inspired by H.R. Giger. Stunning! I absolutely love it!! Simply perfect, very fast delivery and top quality product. Thanks a lot! 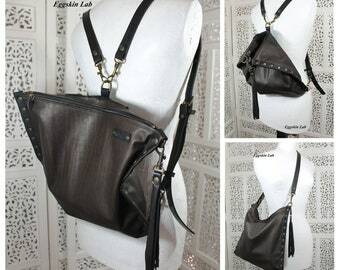 Unique piece, recycling-reuse collection, purse made of soft leather, shoulder bag, crossbody bag, purse, leather purse, italian leather. Magnifique ! Sac de superbe qualité, travail très soigné. Les anses sont d'un cuir épais ce que j'aime beaucoup, le petit plus c'est qu'elles sont gravées. très beau rivets. Merci pour les petits portes-clés, il sont gravés aussi. Emballage très soigné, Les pièces du sac sont très bien protégées Enfin en un mot super, je recommande ce créateur à 100 %. 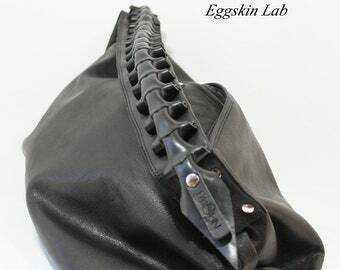 EGGSKIN LAB is a handcrafted laboratory of artistic and bizarre leather goods. Begins to exist thanks to the attentions, energies and suggestions of the people who orbited around it, even for a short time. Initially we worked industrial wastes, and research in the trash was the beginning of the fun, a treasure hidden under the banana peels. Like a game, an experimental laboratory began to come to life. With the passing of time and changing needs, such as Nature wants, it was decided to search for new materials and to focus on quality, style and sophistication in details. Thus was born a new era for EGGSKIN LAB, from scraps and waste materials we have moved to the leather warehouses to gain a new identity, studying and playing on new forms. Animals, insects, their slippery shells, the grooves, the roundness, the horns, the ridges, in the wonderful setting of the details that, merging, create the Everything. Life and its inhabitants, imagination and immersion in the spaciousness of the peace are the ingredients that bring out the inspiration for new forms, along with figures of horror and fantasy that contaminate ideas. Past and future interpenetrate the present in the silence of no time. So it is EGGSKIN LAB, an eye that observes the movements of Nature, outside and inside itself, captures the details, molding them and giving life to unique objects. The care and the development of a valuable idea and the translation from the mental to the physical dimension, in a Process that sees objects emerging from the hands of someone, manipulating the material to create. If you are sending this as a gift please let me know in the notes to seller box not to include the receipt and I will gladly include a personalized message upon request for free. - The most of items are made to order and will be shipped within 3 - 8 business days of payment. - Customized items usually takes about 3 - 10 business days to make. - The ready items will be shipped within 1 - 3 business days. I ship your order with a tracking number. 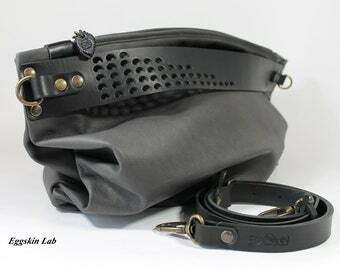 The leather is a natural material and then it can have imperfections. The items are never equal because they are done to hand. The earrings are made in italian leather and sterling silver marked 925.